I always hated the ridiculously big guns drawn in the Image comics of the early 90’s. But in this case, it worked for the scene. At least Bennesaud is physically capable of manning such an oversized weapon. I really wish I had room for one extra panel between the last two. I just think it would have made for a funnier beat to have an additional panel of Cember and Bennes looking at Hamron’s ship or looking at each other before Bennes asks, “How was your drink?” I think that extra moment between being in extreme danger and Bennesaud’s very casual line would have been nice. 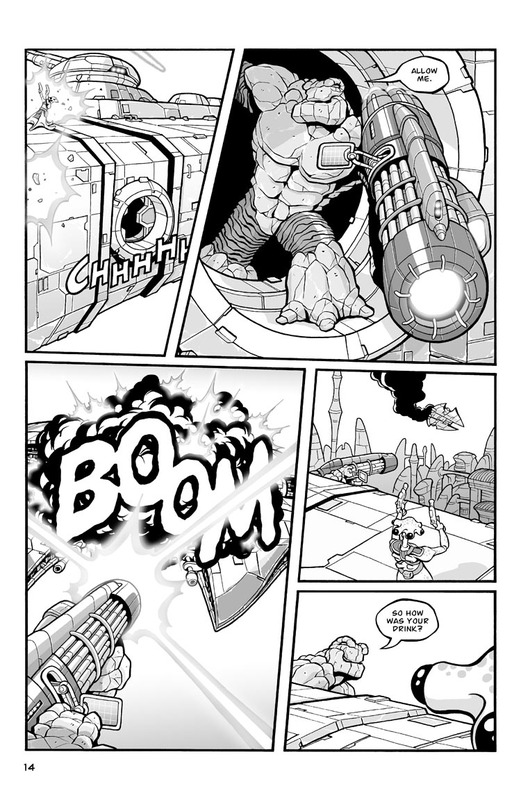 But I needed two large panels on this page: one for Bennes appearing with the gun and another for the shot itself, so that limited how much additional space I’d have for that kind of extra beat, unfortunately. I find it hard to believe that no one has commented on this page. Panel 2 is fantastic. At first glance, it played out like a film in my head; the barrel of the weapon emerging from the hatch into the daylight, then a hand on the rim and a meaty THUD as Bennesaud puts his weight on his leading foot and sights in. There IS a Runners movie in the works, right? Right? That’s always a huge complement when people tell me how cinematic the comic series feels. A couple people have even said they could hear a soundtrack in their heads while they were reading the book! Storytelling flow is a big deal for me, so it’s always great to think that a series of images drawn on a page can have that power to make a scene actually feel like it’s moving. Yay! I had some trouble finding the Runners video on YouTube until I thought to search for the artist’s name. Search for “Sean Wang’s Runners” and it comes right up. Funny! Awesome scene from an awesome movie! and this kids, is why always having one man-portable anti-starship weapon on your ship is a good idea. It also heats up food REALLY quickly in a pinch if the microwave is on the fritz.